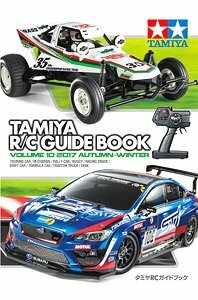 – Tamiya’s main RC model, including new products announced at the Hobby Show, is released at once. – It is a handy one for picking up a machine for each chassis and searching for one favorite one. – It is also full of recommended contents especially for RC entry users. – A QR code linked to the search WEB page of each chassis video and corresponding option parts is also posted. – All color A4 size, 38 pages with plenty of volume. – With chassis-specific parts matching list convenient for tune-up. This entry was posted in Future Releases, Media on October 4, 2017 by admin.